Radium Engineering has just released a range of products for the 2015+ Subaru WRX with the FA20 engine. These products are designed to improve the driveability and performance of the WRX without sacrificing reliability. The WRX version of the FA20 engine is equipped with tumble generator valves to assist with emissions during cold engine temperatures. These devices also impede air flow in the intake manifold runners. By eliminating the obstruction, a clear airflow path is established. The Radium Engineering TGV deletes are machined from 6061 aluminum and anodized green or black. Installation is quick and easy (compared to EJ-series engines) and can be performed in about 30 minutes. The tumble generator valves are an emissions control device, and as such should be removed only for vehicle operating off-highway. It is also recommended that a complimentary engine management tune be implemented to take full advantage of the TGV deletes. No permanent modifications to the vehicle are necessary to install the TGV delete kit. 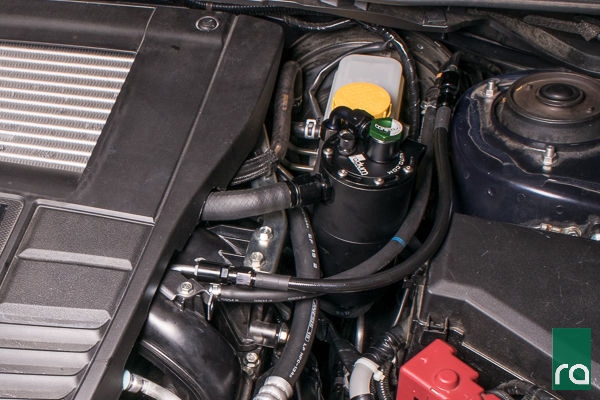 Even with low mileage modern cars, oil accumulation in the air intake stream can happen. The Subaru FA20 engine places the turbocharger down low, in front of the engine. This leads to oil from the PCV system collecting in the turbo air inlet pipe, down near the turbocharger. This oil is result of blow by coming through the crankcase ventilation system. This oil will eventually be digested by the turbocharger and deposited through the charge piping and can even result in blue smoke from the tailpipe. The Radium Engineering Dual Catch Can Kit intercepts the PCV gasses and traps the oil and other pollutants before they can make it back into the intake stream. The kit tucks in perfectly on the RH side of the engine bay next to the ABS module, mounts to existing engine bay fasteners and requiring no relocating of engine bay components. 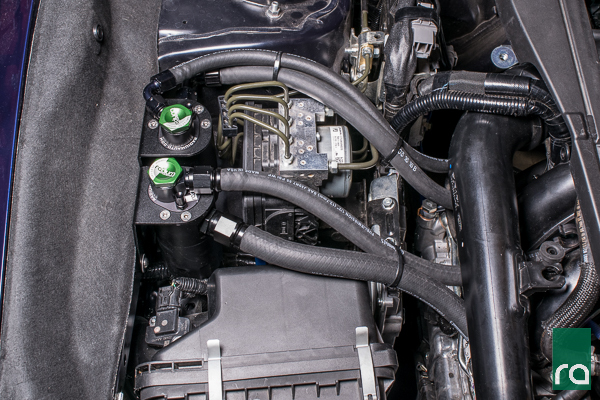 The front catch can intercepts the crank case vent hose that connects to the turbo inlet pipe, keeping oil out of the turbo inlet. The rear catch can intercepts the PCV hose coming off the block and going to the intake manifold, keeping oil out of the intake manifold. 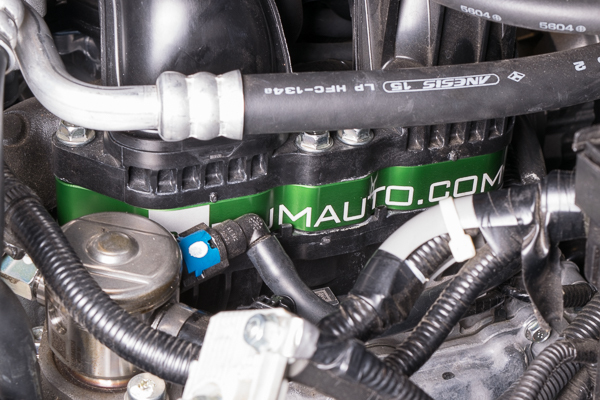 The catch cans are designed to withstand boost pressure and are sealed, so direct connection to the intake manifold, even with forced induction, is OK. This kit is perfect for a street driven car experiencing mild amounts of blow-by. For more race-centered applications, or cars with built high-powered engines, more oil blow by is usually experienced, often overwhelming the volume of the standard Radium catch cans. For these applications Radium Engineering applied it's Air/Oil separator to the FA20 engine. 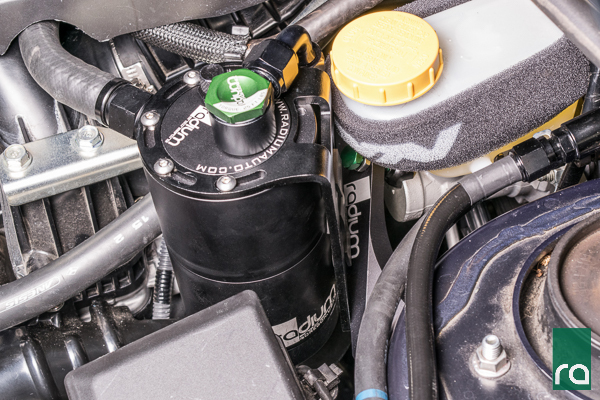 The Air/Oil Separator functions in a similar manner to the catch cans, however, the big difference is that oil is returned back to the engine, rather than stored in the catch can. 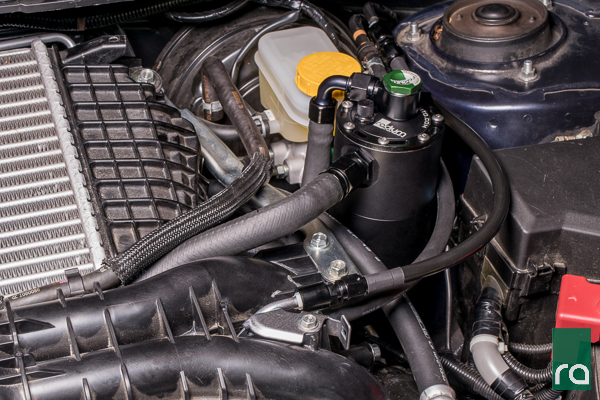 But catch cans do not only catch oil, they also catch water condensation and it is not ideal to have this water mix with the oil, then return it to the engine. To remedy this, the Radium AOS is heated with engine coolant. This keeps the water vapor from condensing and mixing with the oil. Engine coolant is plumbed through the bottom plate of the AOS. Another important aspect of the AOS is that it does away with the function of the PCV valve. Instead, the engine is allowed to breathe freely from both the crank case vent port (at the front of the engine) and the PCV valve port (under intake manifold). The PCV valve is removed from the engine block and replaced with Radium's custom made PCV delete fitting, shown below. This fitting screws into the block and adapts to a -10AN male. It is straight through, with no check valve or any other device built in. This allows maximum ventilation to the AOS through this port. This is also the path for collected oil to drain back to the engine block. With both engine ports breathing freely into the AOS, the AOS needs to be vented to atmospheric pressure. This is done by routing the AOS side port back to the turbo inlet pipe. This creates a closed-loop system. 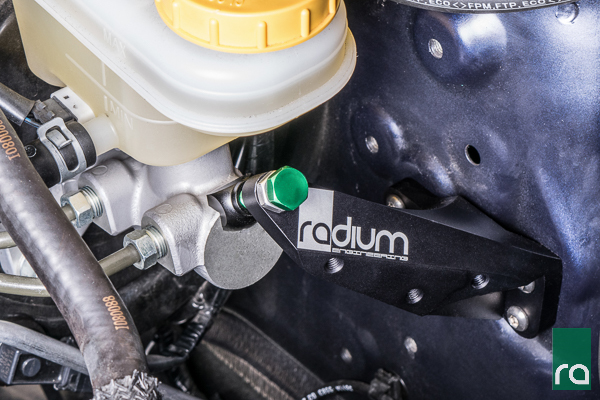 The AOS was designed to mount in the engine bay near the brake master cylinder (for LHD vehicles only) using the Radium Master Cylinder Brace for the 2015+ WRX as the mounting point. The master cylinder brace is a simple and effective way to reduce firewall flex resulting from brake pedal pressure.It is machined from 6061 aluminum and mounts to the strut tower using pre-existing threaded holes. Clearly visible in the photo below are the three threaded holes in the brace where the AOS bracket attaches. The brace is sold as an individual item, or as part of the AOS kit. While installing an AOS kit can be done with the stock fuel feed hose, Radium offers an aftermarket fuel feed hose replacement that cleans up the fuel routing and offers better clearance with the AOS. The hose has a PTFE core that is compatible with all fuel types and also features machine-crimped end fittings. For all of the products shown here, and a few more, please click HERE.